"Would you like Wasabi with that?" Likes: MOCing (duh! ), Sushi (double duh! ), traveling, writing. -I live in Nature's Pothole, Oregon, USA! You can see snow, ran, sun all in the same day! -Cordaz v2.0 is the current version of my self MOC! -I've played cello for nearly eight years! -I also write literary fiction! -I am a 1st degree black belt in Ki Aikido (A martial art)! -I have a german shephard named Rico! -I speak English and becoming fluent in Japanese (lul weeeeeeb)! -My first LEGO set ever was Tahnok the Bohrok! -This account has existed since 2009, however, I didn't become active until December 2012! My Self MOC, Toa Cordaz. 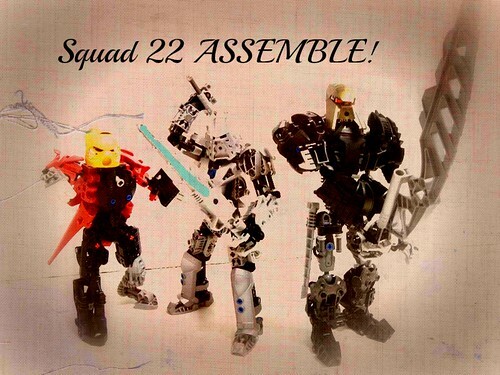 Editing done by Stormjay Rider, one of the many friends I've made since I joined MOC Pages. Go check his stuff out! The three members of Cordaz's Toa Team, "Force 22." Poster art done by fellow MOCcer and friend, Hazeroth. Did I mention he's an amazing MOCcer? Go check him out! An amazing title card for my Last Legacy storyline made by Bumblebee5253. Lovin' dem creepy eyes. Do I need to say it? Go check him out! Corva 2.0, a Corporeal Mirror Oh hi, look who's still not dead. Consider this a character reboot. Every hero has a shadow. Toa of Sushi has written in the group Ze BIONICLE MOCists! Toa of Sushi has joined the group "MOCpages Help". Toa of Sushi is one of Meepinater C.'s favorite builders!